On June 5, 1998 at his home, Okoroire. Beloved husband of the late Thelma and loved father of Lourie Taylor and Diana Rhodes. Lovingly known as Poppa Bill to all his grandchildren and great grandchildren. 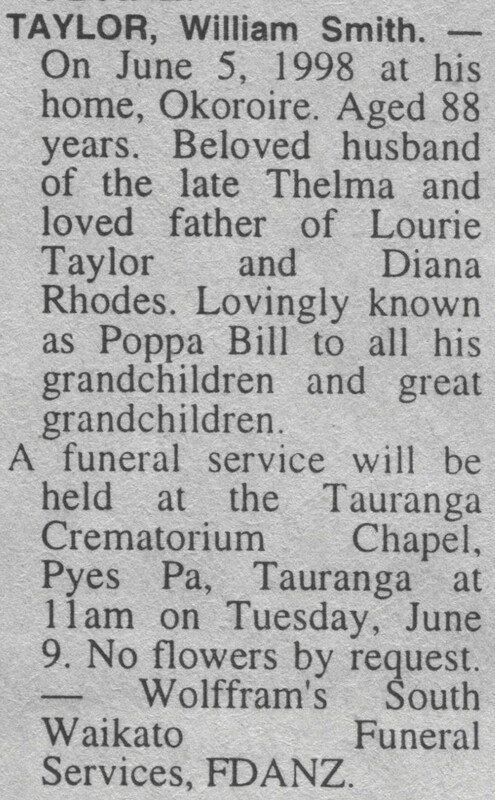 A funeral service will be held at the Tauranga Crematorium Chapel, Pyes Pa, Tauranga at 11am on Tuesday, June 9. Wolffram’s South Waikato Funeral Services, FDANZ.